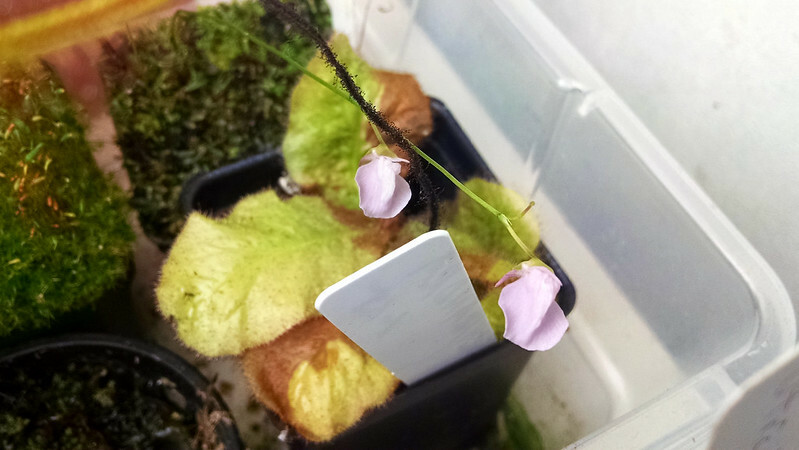 Utricularia roundup, February 2016 |Sundews Etc. Everyone knows that Drosera is my favorite genus of carnivorous plants. I mean, it's in the name. 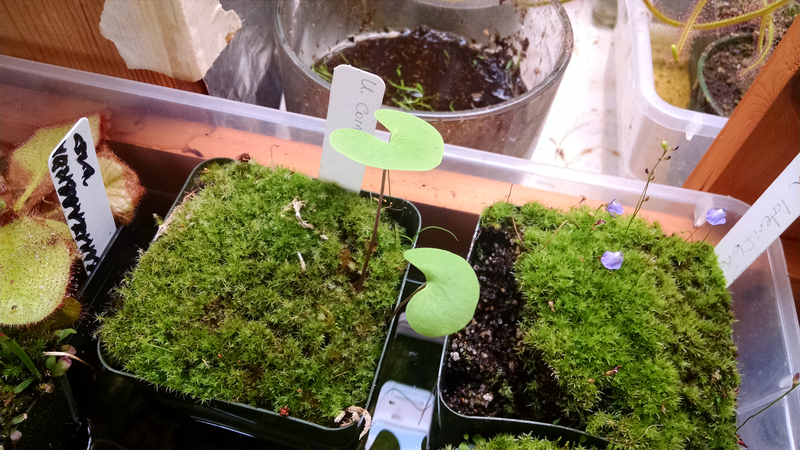 The number 2 spot goes back and forth – sometimes it's Pinguicula, but lately I think it's been Utricularia. It's funny, because when I was first first starting out I didn't get Utricularia at all. I had no idea why anyone would bother growing such weird, dumb little plants. Incidentally, I still feel that way about the aquatic species (but don't tell anyone). Why Utricularia? 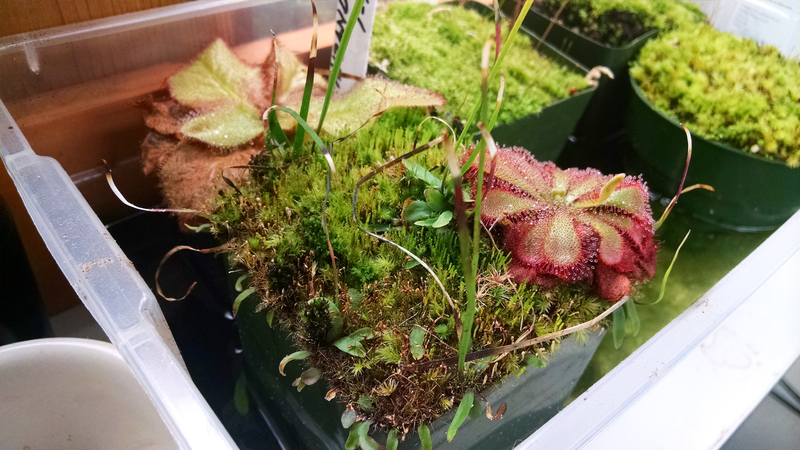 Well, as with sundews it's a big, sprawling, cosmopolitan genus. There's a huge variety out there to explore, and several different cultivation styles to master. And of course, the flowers are a real treat, whether it's cute little spray from the easy terrestrials, or a more impressive display from larger/touchier species. Of course, the fact that very few people seem to specialize in Utricularia just makes them that much more attractive. In any case, I decided to check in on my collection today. This collection of Utricularia lateriflora flowers got me started with the pictures. This is one of my favorite species right now. It flowers pretty freely, and the flowers are adorable – dark purple with a white splotch. Next door, my Utricularia cornigera is doing very well. Those are some nice-looking leaves. I'm glad these have recovered from dying back a few months ago. Based on how I've seen new leaves come up on this one, I feel like it would favor an airy LFS planting in a net pot. Maybe I'll do that once it gets a chance to grow in a bit more. 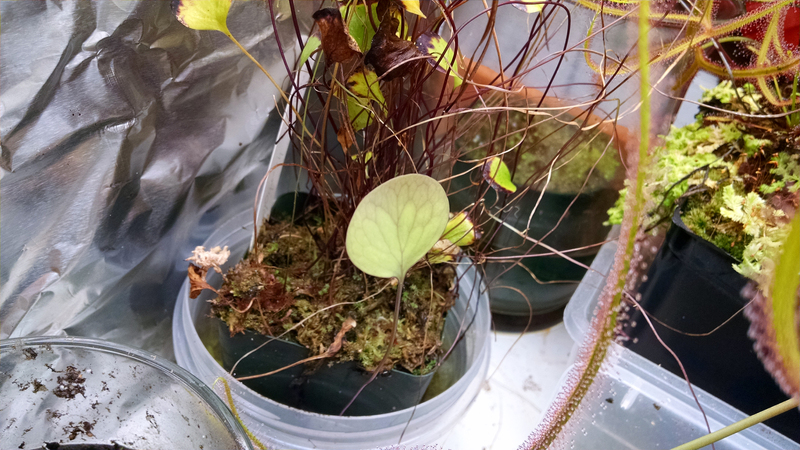 My other plant from section Orchidioides, Utricularia humboldtii, has put out a new leaf. I like the venation on those leaves. This one is pretty slow to make new leaves, but I understand that's pretty normal. I should trim all the dead growth and messy stolons to get a better picture of what it looks like. By the way, this plant has been found at elevations of more than 8000 feet (2500 meters). That's really high! 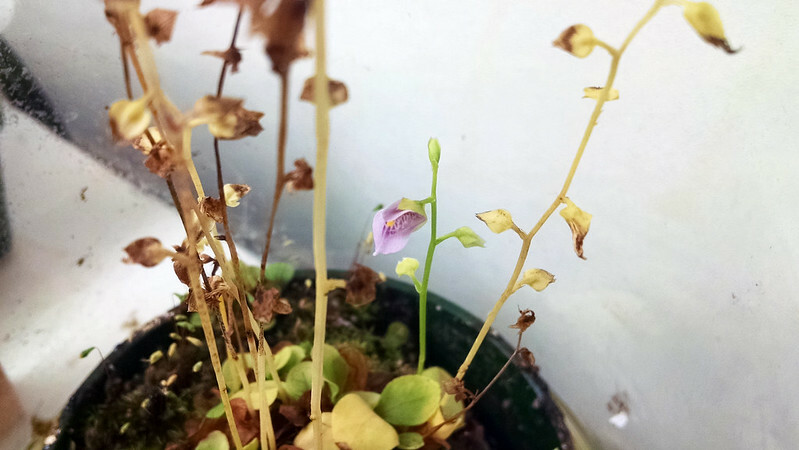 Nearby, the Utricularia heterosepala flower stalk fell over after I jostled it recently. Man, it would be awesome if another flower popped too. I'm seriously impressed with this plant. It's been holding both of the flowers for a while now, and there's no sign of giving up. Really fantastic grower, looking forward to getting more blooms from it. Utricularia calycifida has a somewhat similar flower, although the bloom stalks typically support only one at a time. This flower has awesome patterning on it. This is the first time it's rebloomed since the last big show. I really feel like I should repot this plant into pure LFS. It's been so hard to find time to do serious plant stuff like that lately! Alas. One of the plants that I've never been able to flower is Utricularia praelonga. This is one of those plants just just hangs out, waiting to do something. This oddball utric grows two different kinds of leaves, and is notoriously difficult to flower. I've seen some in bloom in cultivation though, and I'm trying to get some tips. The flowers are supposed to be large and yellow. 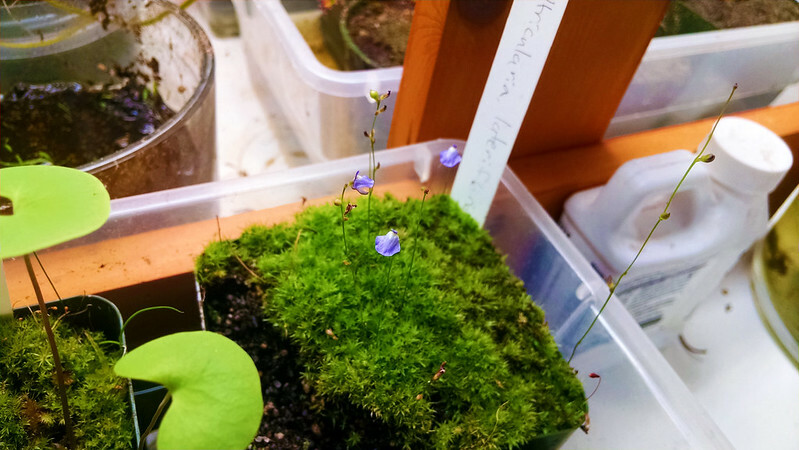 Utricularia sandersonii is one that flowers for me, but very weakly. This first pot has had like 2 flowers, and is covered in a really robust moss of some sort that I do not like. 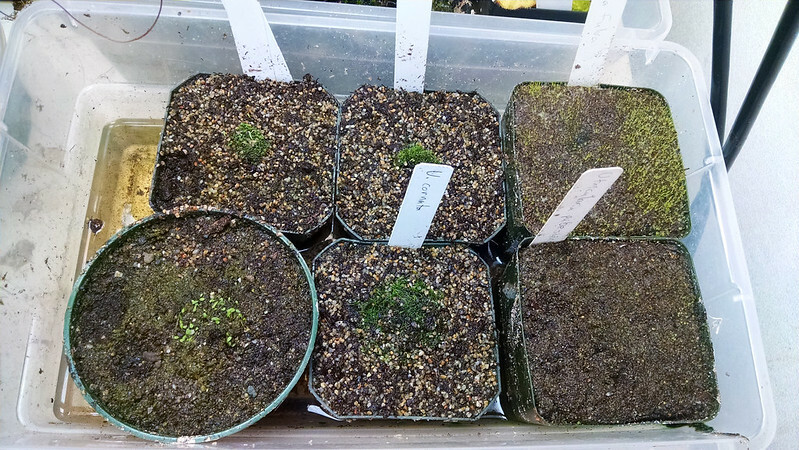 Whereas in this next pot, it's definitely losing the fight to Utricularia subulata. Not sure what the problem is with this one for me. I know people who can't help but get a big carpet of bunnies. Maybe I should try some in a windowsill. 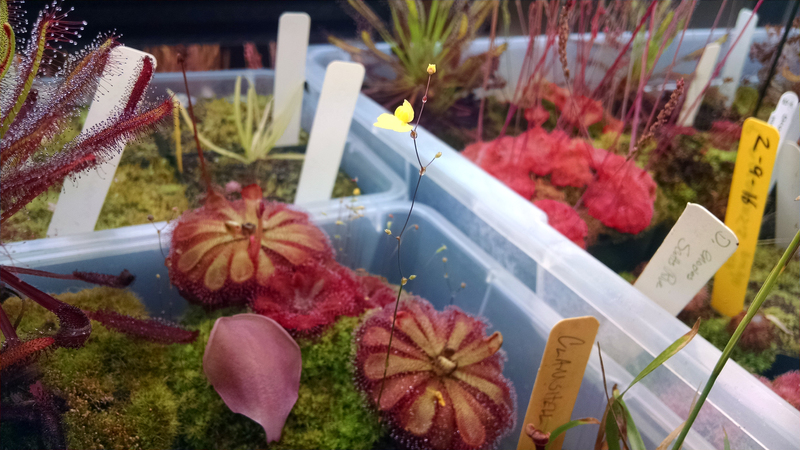 Speaking of U. subulata, my big, proper bloom is looking so good right now. U. subulata always breaks your heart. I wish wish wish it would do this all the time. This is a fantastic flower! Ah well. Maybe the fleeting quality of it makes it more special. One thing I did recently was break up a few of my well-established plants to share around and propagate. 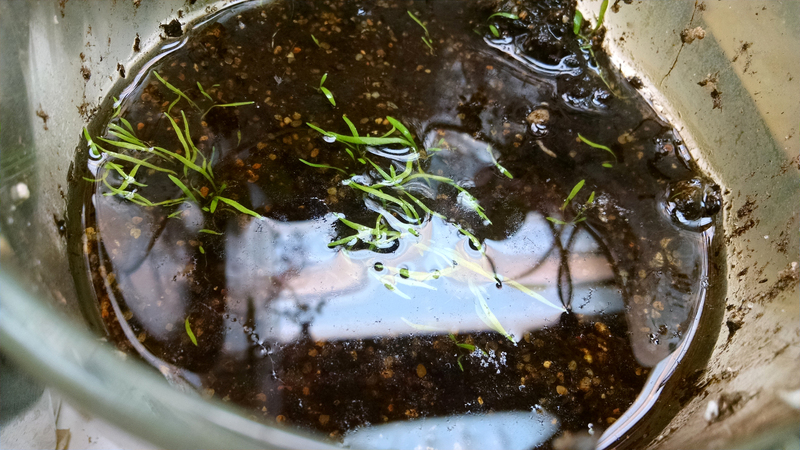 Here's my Utricularia gramnifolia getting started again. Looking forward to this filling in and blooming again. 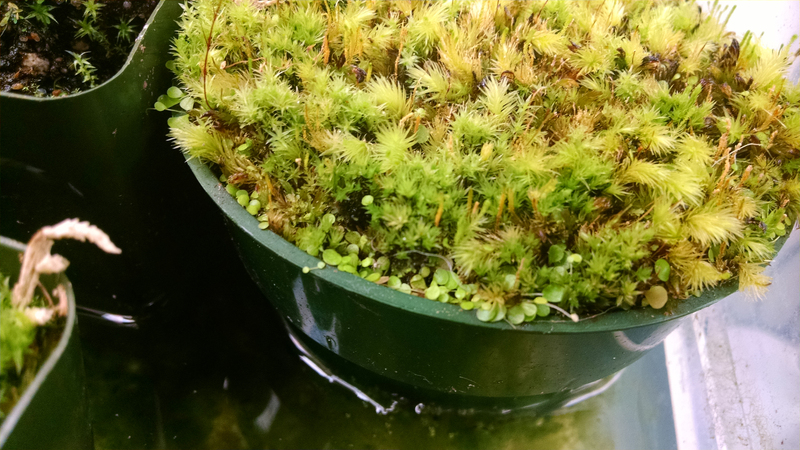 The submerged aquatic setup in an undrained pot seems to work pretty well for this plant. I suspect a lot of the terrestrials would like this treatment, actually. Might be fun to try them in teacups, like the Carnivore Girl. This tray has starts from some of the pots I broke up, as well as a couple new specimens I'm just getting started. So much promise in these pots! Clockwise from top left: Utricularia 'Betty's Bay' (a large-flowered form U. bisquamata), Utricularia blanchetii, Utricularia fulva, Utricularia pubescens, Utricularia cornuta, Utricularia livida. I've been flooding this tray to try and jump-start these guys. 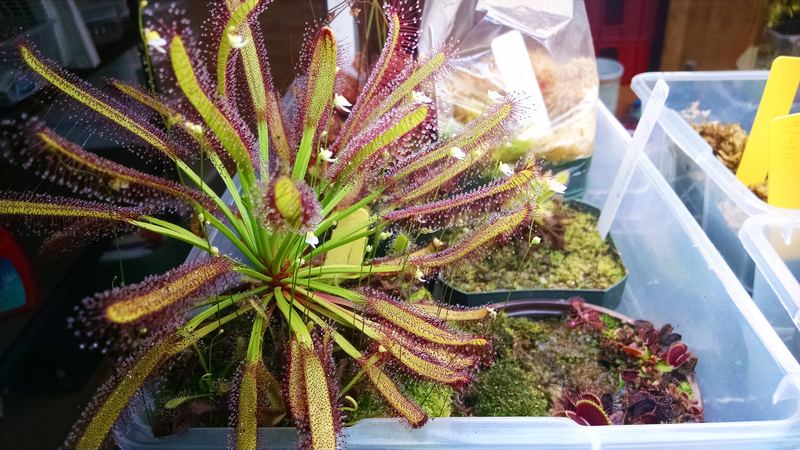 Finally, I took a picture of some U. bisquamata among my wide-leaf Drosera capensis. I love how the flowers all face towards the lights. It's just too cute. Even though it's a weed, it's a wonderful plant. That's true of both of them, actually. No respect at all! Incidentally, my Utricularia longifolia is blooming. It's not in my collection right now because I brought it for display at the Pacific Orchid Expo. I'll feature that one later. I've had U. longifolia for over a year now and I'm still waiting for it to bloom. I have both the normal Sandersonii and Blue form and they are in constant bloom. AWESOME species! All grow in a west window. 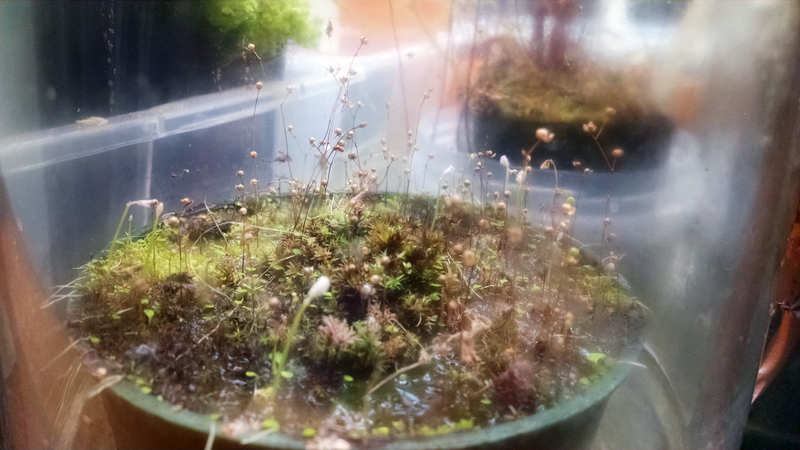 Yeah, Utricularia seem to like windowsills. I heard that from several people. With my U. longifolia I tend to let the tray go a bit dry before flooding it up to the level of the media. Not sure if that's what leads to the blooms, but that's how I do it.